Strongly aromatic. Used for healing of the gums, ulcers, bleeding conditions, (astringent) ulcerative colitis, Crohn's. Helps all kinds of health conditions by taking the tea several times a day 5 days a week. Putting sweet fern leaves mixed in with a batch of blueberries helps magically preserve the blueberries for weeks, even a month. 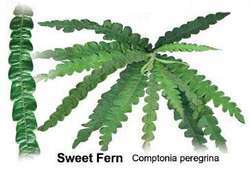 It is said sweet fern helps preserve life itself.